I originally planned to take that recent beef-workshop experience as an inspiration to simply recreate that recipe of Julia’s as I had made it before. It was perfectly delicious. But then as I scanned my previous post for the first time in a while, I had a striking revelation: in my refrigerator was a tub of beef tallow, one among a number of product samples I’d just been given from Cauldron Broths. So where, in her recipe, Julia calls for “2 tablespoons softened butter, ground beef suet, beef marrow, or fresh pork fat” (because of course she would), and where last time I had used butter, this time I could use tallow. Which is basically rendered suet (the solid fat found in beef). 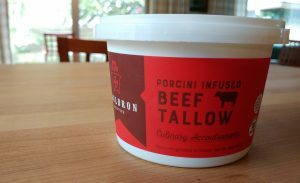 And as a flavor bonus, the Cauldron beef tallow is very subtly seasoned with porcini mushrooms and sage leaves. So I remade the Bifteck Haché à la Lyonnaise once again. Chuck steak, cut into cubes and ground with my KitchenAid attachment. Butter-sautéed onions, seasoning and that beef tallow, which contributed a distinct beefy character even before the ground beef hit the bowl. I formed the burgers a couple hours ahead and refrigerated them, which seemed prudent given the richness of the mixture. 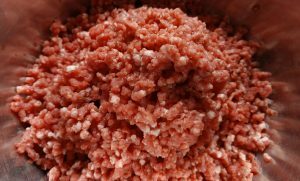 That and the slightly coarser-than-average texture of the ground beef. A chill helped the burgers hold their shape when hitting the hot pan. To complement the burgers, and to continue the French frame of mind, I opted for a simple watercress salad with a Dijon vinaigrette, and roasted potatoes. The latter were cooked with a light coating of not the olive oil I’d usually use, but more of the beef tallow. I first melted it in the baking dish, then lightly tossed the potato pieces in the tallow before roasting until browned and tender. And just because I was confronted with beautiful morels at the store, I embellished the pan sauce with them, with a good dose of the beef bone broth reduced with the mushrooms. A bun? Completely unnecessary. Cauldron products are anchored by their line of bone broths (whether you’re a bone broth enthusiast or a “you mean stock, like we’ve been making for generations?” cynic, it comes down to richly flavored, healthful liquid for cooking or sipping), but includes adjunct items such as the tallow and also a decadent chicken schmaltz lightly seasoned with ginger and garlic. In the greater Puget Sound area, Cauldron products can be found at some PCC Natural Markets and will soon be carried at Metropolitan Markets as well. At the time I’m writing this post, the Cau ldron web site is showing many of their products as out of stock, but I’m assured all should be available again before end of this month. I didn’t intend for this post to have a seasonal hook exactly, but when I got one of those inevitable “break out the grill, it’s Memorial Day weekend!” press releases, I realized the classic first-grilled-burger-weekend-of-pre-summer is just around the corner. 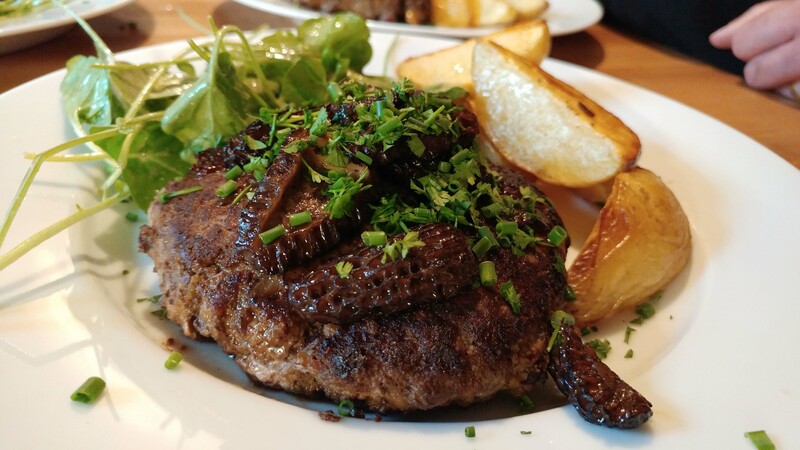 So should you want to imbue your Memorial Day festivities with some exquisite character, a certain je ne sais quoi, by all means — invite Julia’s burger influence to the party. Melt 2 tablespoons of the butter in a small skillet over medium-low heat. Add the onions and cook, stirring occasionally, until very tender but not browned, about 10 minutes. Put the onions in a large bowl and let cool. Add the ground beef, softened butter or tallow, salt, thyme and pepper. Lightly beat the egg and add it to the bowl, using a large wooden spoon to thoroughly blend the ingredients. Form the mixture into 4 to 6 patties about 3/4 inch thick, arrange on a plate, cover and refrigerate for 1 to 4 hours. Melt the remaining 1 tablespoon butter in a large, heavy skillet over medium heat. Add the burgers, cooking them in two batches if the skillet isn’t large enough to accommodate them all at once. Cook until nicely browned on the bottom, about 4 minutes. Turn and continue cooking to your taste, about 2 minutes for medium, 3 to 4 minutes for medium-well to well done. Transfer the burgers to a platter and cover to keep warm. Scrape out any burned cooking juices and pour off all but about 1 tablespoon of the fat. 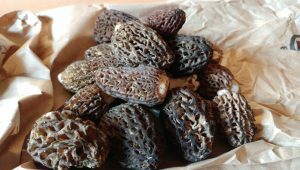 Add the morel mushrooms and cook over medium heat until partly tender, 2 to 3 minutes (if a little more fat is needed, add a bit of butter). Add the broth and boil for a minute or two, to reduce to a sauce consistency. Season to taste with salt and pepper. Arrange the burgers on individual plates. Spoon the morels and sauce over, top with chives and chervil, and serve.